Duplex wall receptacle where both the upper and lower socket are connected together. By far the most common method of connection. 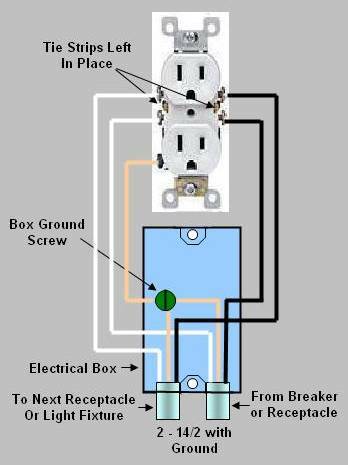 Duplex wall receptacle where the upper and lower sockets are split and powered from separate breakers. This is very popular in kitchens to provide more power to countertop appliances. Duplex wall receptacle where one of the sockets is controlled by a wall switch. This is popular in living (great) rooms and bedrooms for turning on table and floor lamps via a wall switch. Single socket receptacles. These are common for electric ranges, laundry dryers, window and wall air conditioners and wall clocks. Duplex wall receptacle where both the upper and lower socket are connected together and powered from a common circuit. Turn off power to receptacle at breaker panel. Insure that power has been turned off to both sockets by plugging in a lamp or a device such as an electric drill in both sockets (one at a time is acceptable). Remove the receptacle cover plate, usually held in place with one screw in the center between the sockets. It should be noted that some manufacturers are now making screwless cover plates which must be pried off with a screwdriver. Remove the upper and lower screws that hold the receptacle to the electrical box. Pull forward on the receptacle until the receptacle has cleared the box and the wires are extended. One black wire on the brass terminal on the side of the receptacle, one white wire on the silver terminal on the opposite side of the receptacle and a bare copper wire connected to a green screw which is integral to the outlets (receptacles) mounting bracket. This wiring configuration indicates that you are at the last electrical receptacle on this circuit (depending on the use of the receptacle it may be the only receptacle on the circuit. Two black wires on the brass terminals (one on each terminal) on the side of the receptacle, two white wire on the silver terminals (one on each terminal) on the opposite side of the receptacle, see Figure 3. This wiring configuration indicates that power goes from this receptacle to another receptacle or possibly a light fixture or associated switch (Figure 4). It is possible that only one white wire will be connected to the terminals - in this case there should be a group of white wires connected together with a wire nut in the electrical box and this white wire connects to that group). Figure 3 - Common duplex electrical outlet wiring.